What To Do When Your Battlegroup Goes Down! « It's For My RP Spec! What To Do When Your Battlegroup Goes Down! My realm is down for 24 hours? My whole battlegroup is down for 24 hours?! Almost all of the servers that I frequent rest within the buggy Whirlwind battlegroup. Our time for the dreaded 24 hour maintenance is finally upon us. Why, play alts on other battlegroups, of course! While I have very few characters outside of Whirlwind, I do have a few notable ones. And by “notable” I clearly mean “alts I have WoWBarbie’d”. Namely, Celarus, level draenei 62 priest on Ysera-US. 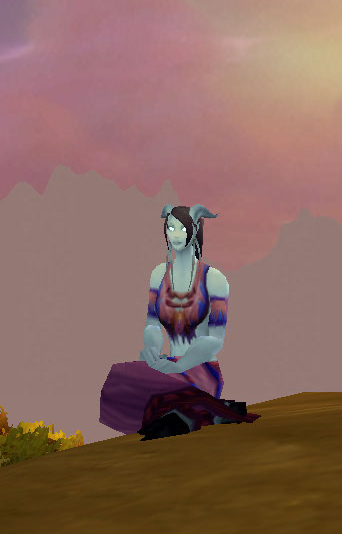 Celarus began her life as a baby draenei on Eitrigg-US. 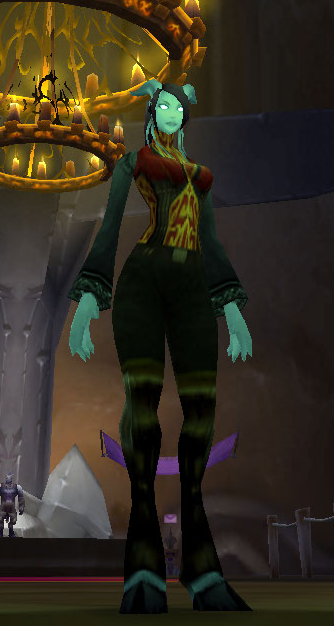 Her name was Sitara and she was a drunken promise to help friends in Karazhan. Yes, that long ago. She stalled at level 50 and there she stayed. Until! Kiore and some other friends were playing on Ysera! So I transferred my little wannabe mana battery off to Ysera to forge a new life as a healer. But along the way, something funny happened… her wardrobe grew… and grew… and grew. 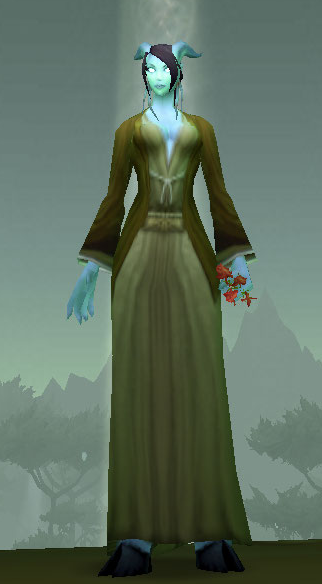 My first outfit for Celarus is one that I try to get for many of my priests. The Silver-thread Set! 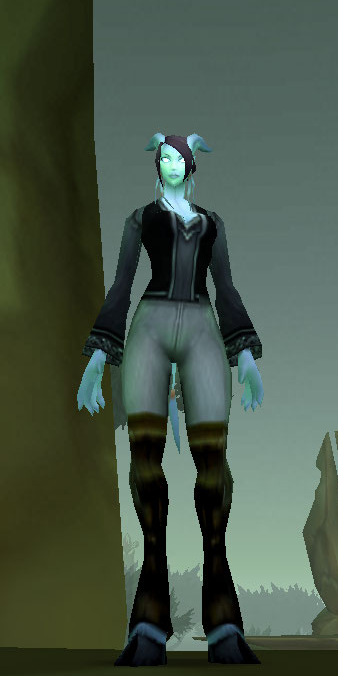 I use Spidersilk Boots instead of Silver-thread Boots but either one works. Next has two variations, a red and a blue. A more tribal look, perhaps. 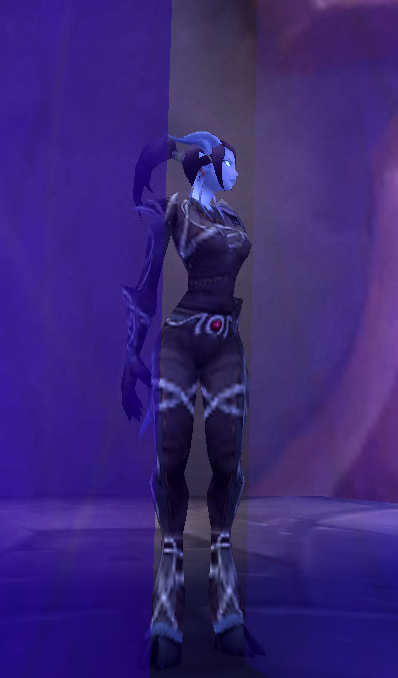 This is a simple outfit; I wish the boots were either a bluer black or a more true black. What spacegoat’s closet would be complete without a trampy little black number?! 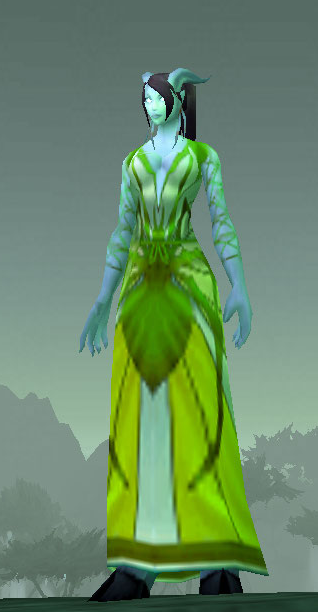 A lovely dress that is disappointingly Alliance-only. 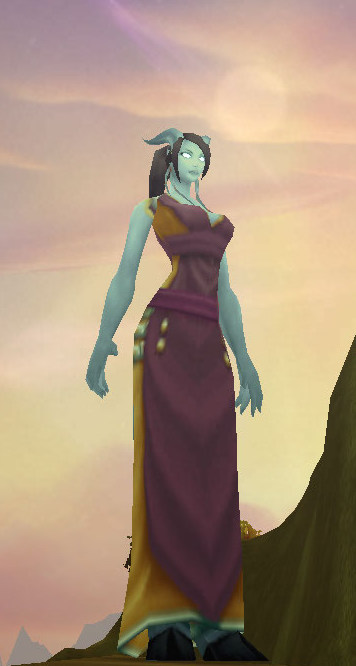 And finally, a robe that draenei fill out so well.